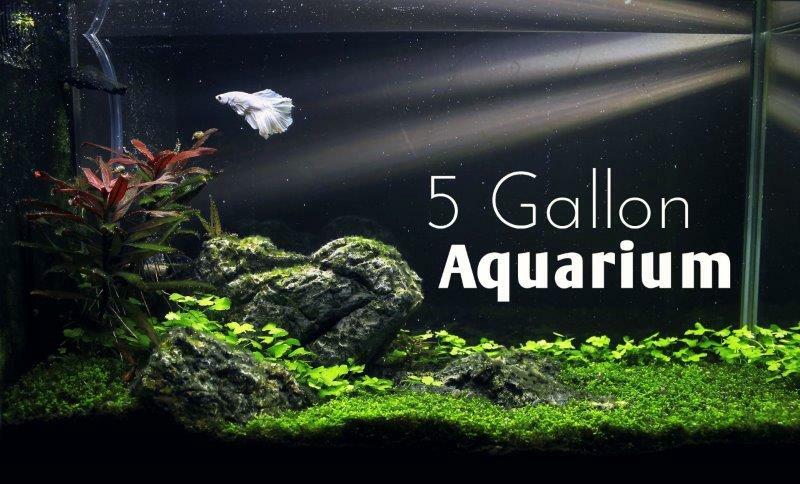 Let’s start with, why a 5 gallon aquarium? 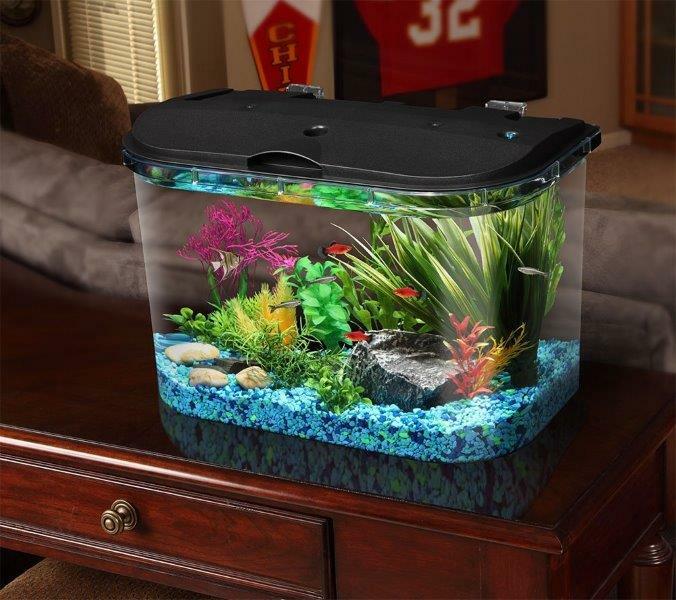 Small 5 gallon aquariums are great for an office desk, table, or even kids room. 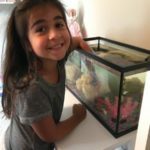 They are great if you are limited on space or just getting started with the hobby of underwater pets. Typically 5 gallon aquariums are used for freshwater fish such as Betas, Tetras, Mollys, and Goldfish. These fish are normally inexpensive, easy to care for, and are very relaxing to watch. I have owned all of these types of fish at one point or another over the years. 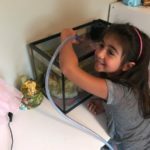 In this article I will go over the key items you will need to setup a 5 gallon aquarium and will also review a few popular 5 Gallon Aquarium Kits that combine several of the essentials into one package making it easy to get started. I absolutely love this aquarium. It has an awesome look. It includes a nice LED lighting fixture. The 3-stage filtration is included in a separated filtration compartment. This tank looks and works great. In theory all you need is a bowl and some water to keep some fish alive. If you do regular water changes and aerate the water frequently, it is possible. Anyone who has ever won a Goldfish at the fair knows that is much easier said than done however, and is why most people who have simply bought a $5 fish bowl and a $5 fish have literally flushed that money down the toilet just a few days later. Here is what I recommend you pick up to get started. Don’t let this list worry you, although it seems like a lot it really isn’t. Filtration System: A system that can move at least 15-25 gallons per hour (GPH) will give enough water flow w/out being too much on little fish. Replaceable filter bags full of activated carbon allow for easy cleaning and will keep your tank crystal clear. Canopy: Some sort of cover over the tank is a must. This will help to reduce evaporation as well as keep your fish in the tank. Believe it or not many fish will actually jump out of the water and in a lot of cases won’t land back in the tank. A canopy will help avoid this very sad situation. Lighting: Although your ceiling light will let you see in the tank, having a light on the tank itself makes for a much more enjoyable experience for you and your fish. If you want to add live plants in the tank, this will have a big impact on their growth as well. Heater: There are some fish, such as standard Gold Fish and Bloodfin Tetras that do well in a cold water tank (62F – 74F). They also do just as well in a tank kept at 76F – 80F which is the ideal range for most tropical fish. 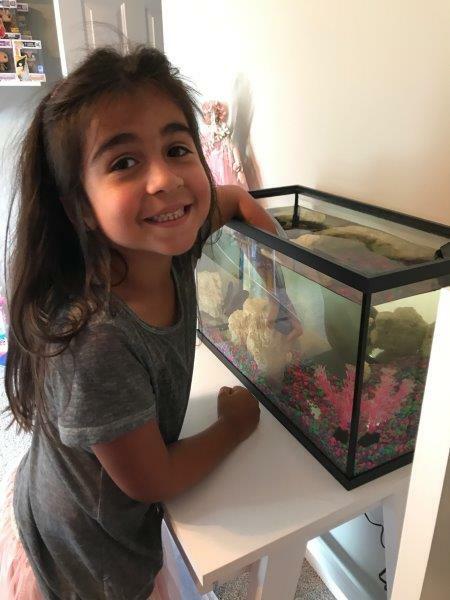 Most aquarium kits will not include a heater and one will need to be picked up separately. Thermostat: Typically heaters will either be fixed at 78F or have a way to set it within a small range but don’t fully rely on those. Get a small thermostat of some sort as a backup so know if your heater ever goes bad. Over time they can stop heating or get stuck on and not cut off. Both situations can be bad for your fish. They are very inexpensive and are great back up indicators. Decorations: This is where you put your own flare in the tank. Do you like river rocks and a couple live under water plants or are you more of a florescent gravel with a bubbling mermaid and treasure chest? A sponge for wiping algae off the inside of the glass. You will want to keep this somewhere it will not be confused with your normal cleaning sponges. Many chemicals used in household cleaning are very toxic to fish. Wiping the inside of your tank with the same sponge or rag you used the day before to clean counters is a good way to guarantee a flushing ceremony. First and foremost feeding is a must (obviously) and depending on what type of fish you select you will just need to drop a few flakes or pellets in once a day. You will want to do a 10% water change once per week. 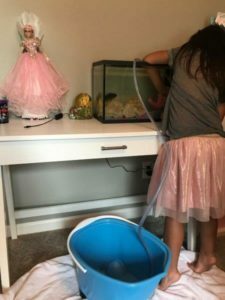 A water change is simply the process of sucking old water out of the tank and replacing it with fresh clean water. With a 5 gallon tank this is only a ½ gallon, so it is not very much. Ideally you would want to syphon this from the gravel so you can also pull out some of the extra food and fish waste that has settled at the bottom of the tank and was not been picked up by your filter. Since we are working with such little water though you will find you reach the ½ gallon mark very quickly and may not be able to clean all of your gravel in a single water change. That is ok, just remember what part you went over this week and do a different area next week. 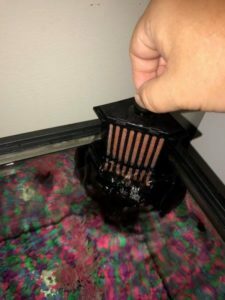 You can also add in larger water changes, say once per month drain about 1/3 of the tank rather than just 10% to really get in the gravel good and remove a large amount of the crud in the bottom. When doing these water changes you can use plain tap water to fill the tank back up but I highly recommend using a water conditioner in the new water before adding it to you tank. A water conditioner will remove any Chlorine and Chloramine from the water. It will also help to detoxify any Ammonia, Nitrite, or Nitrate that is in the water too. Keep a water jug handy to make pre mixing this with your water as well as transporting new water from the sink to your tank easy pezy. If your filter uses replaceable cartridges, swap them out once a month and pre rinse them in the sink to get out any loose particles or carbon dust that may be sitting in them so they don’t get in your tank. Lastly just wipe out the inside glass with a sponge or rag as needed if you ever see any algae building up inside the tank. Be sure to keep what you use to clean the inside of your tank clear of any chemicals and give them a good rinse before and after wiping out the tank. On the outside of the tank you can use glass cleaner to clean off any finger or nose prints (kids like to get close, we understand). Just spray the cleaner on your paper towel away from the tank to avoid accidentally spraying in the tank. 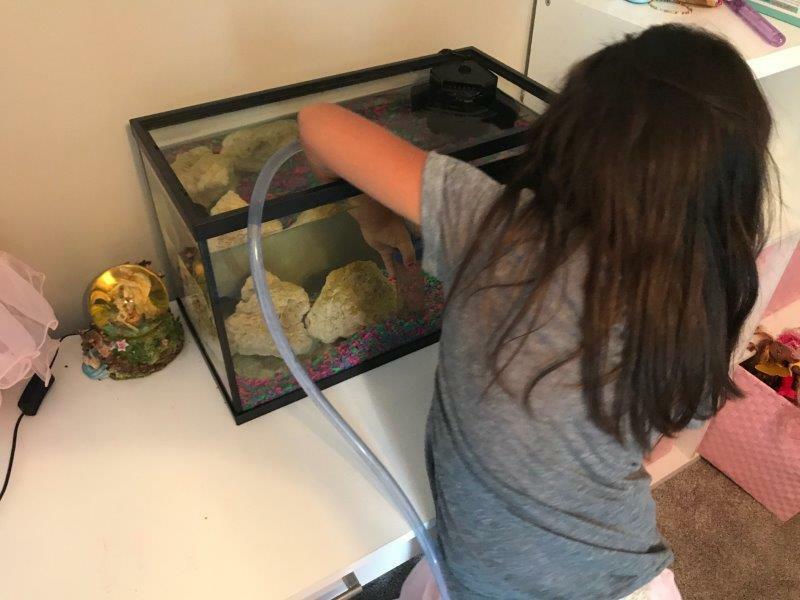 If you have kids, get them involved in the maintenance, especially the little ones. Even just holding the end of a hose in a bucket that would have sat there all by itself is quality bonding and will go a long way for passing on your love for fish. Put down a couple towels before you start and let them get in there with you. 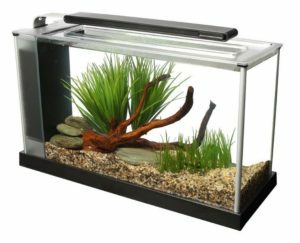 Now that you are informed and ready to get started let’s take a look at some popular 5 Gallon Aquarium Kit Reviews. 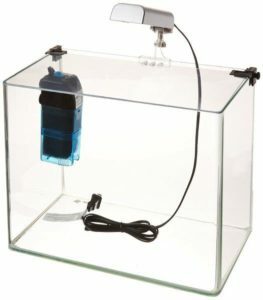 These kits will help you get started and all include the 4 most essential items listed in the recommended equipment list above; tank, filter, light, and canopy. The Marineland 5 Gallon kit is a portrait tank which gives you a very distinctive look. 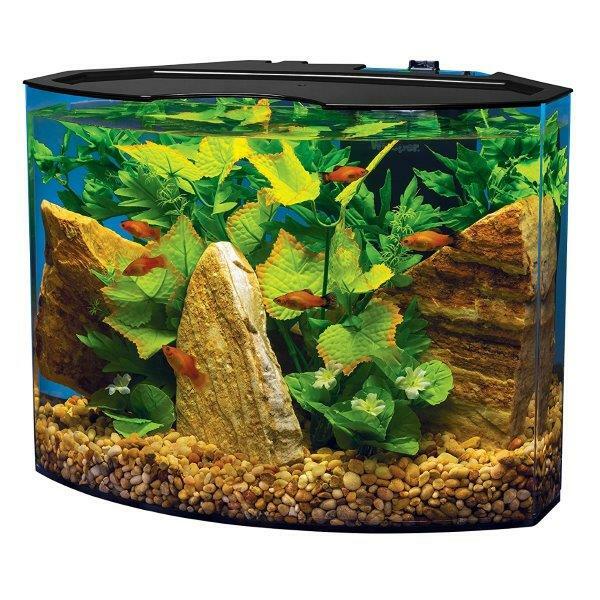 This tank takes the standard 5 gallon dimensions you would find in an ordinary kit at your local pet department store and turns it on its side. The curved corners add to the high end look of this tank removing the standard silicone square corner that would normally disrupt your view from certain angles. 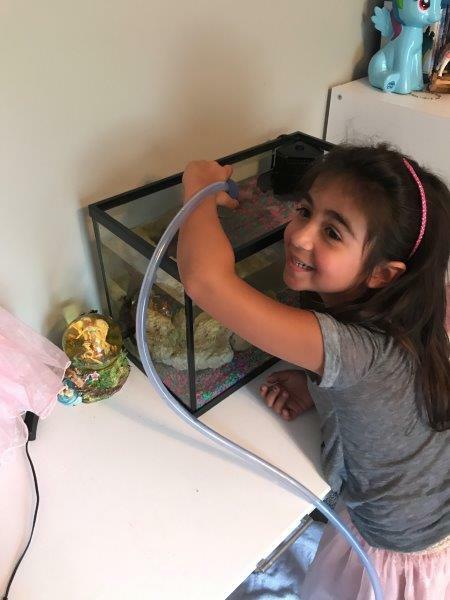 Your under water pets are supported by Marineland’s 3-Stage hidden filtration including a Rite-Size Z Cartridge, Marineland Bio-Foam, and an adjustable flow filter pump. The lighting is supplied by a hinged LED fixture that can be flipped up for easy access to the tank. The light offers a shimmering white day light and a blue glow for night time lighting effects. Cons: The filtration on this system offers a strong water flow and in some cases may be to strong depending on the fish you want to keep. I have heard a few complaints from people wanting to use this for their beta fish who love very slow moving water. Their complaint primarily being that even though the flow can be turned down, was that even on the lowest setting it seemed like too much water flow for their beta. I have also heard of some DIYers adding a few holes to the outflow pipe to disperse some of the flow so they could make it work for their beta. If you plan on having fish that like the faster flow though you would never have this concern. Fluval has created a wonderful contemporary look with its etched glass aquarium and aluminum trim giving it a great high-end styling. The tank is lighted by a sleek overhanging LED system with 37 powerful LEDs. Filtration is handled in a separate compartment on the end of the tank. 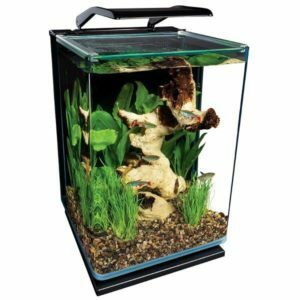 Within this compartment Fluval has added a 3-Stage filtration system providing mechanical, chemical, and biological filtration providing ultra-clear water for your under water pets. The lighting included with this tank also makes this a great option for live plants. Filtration: Filtration compartment with 3-Stage system including foam block, activated carbon, and BioMax bio rings. Cons: Elegance has a trade-off and for the Fluval Spec V it is the tight quarters in the filtration compartment. I have seen some complaints on not being able to really get your hands in the filter side to clean over time. Just remember small tank, small compartment, and pick up a long neck scrub brush to get in the tiny spots. 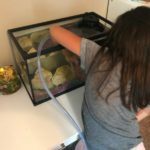 This is a perfect tank for beginners, and experts, but especially beginners (My top choice for kids). 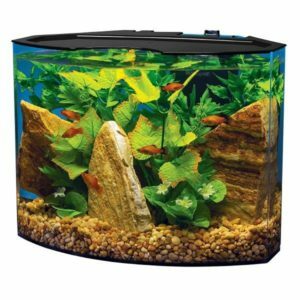 It has a highly durable acrylic tank with curved front and flat back. The coolest feature of this tank is the LED light fixture built right into the canopy hood. The LED light system offers 7 colors! No matter what you or your kids favorite color is you should be able to find one that fits any room; amber, aqua, blue, green, purple, red and white you pick. Cons: This is a great beginner kit and awesome for a kids room or family room. This kit is in a lower price range than the other tanks reviewed and as always that comes with a trade-off. For this kit it comes in the filter although a good filter it is not the best out of the kits we have reviewed and in some cases have not lasted as long as expected. Similar filters though are inexpensive and easily replaced if that were to ever happen. This tanks beauty resides in its simplicity. It has a 3 piece glass construction with 1 curved glass piece forming the front and two sides for great unobstructed views. The fully submersible Cascade filter uses a foam block for the big particle physical filtration and biological filtration then follows up with activated carbon cartridges for chemical filtration. The hinged LED light and clear canopy hinge for easy access and can be removed as needed. The crescent shape of this tank sets it apart. It is a seamless acrylic build allowing for great viewing angles. It is topped with a custom fit lid with built in LED lighting and a crescent cut out at the front for easy access to feed you pets. The system is kept clean by a submersible Whisper filtration unit. This unit provides both physical and mechanical filtration using dual-sided mesh filter cartridges. Cons: Although acrylic is harder than glass to break it is easier to scratch.